Self-shielding, flux cored gasless MIG wire on the larger 8" diameter spools. 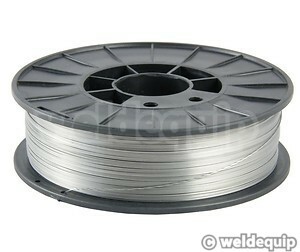 Equivalent to over 10 of the smaller spools, so they represent much better value for money & less wire spool changes. 2" diameter hole centre so they will fit most types of hobby MIG machines & also machines with full size 15kg spool holders. Precision layer wound for reliable feeding, 0.8mm diameter performs much better on thin sheet than the 0.9mm diameter.